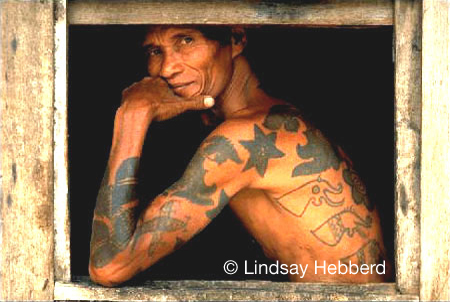 Among the tribes of Kalimantan tattoos are applied for personal embellishment; they indicate tribal affiliation; they empower; and they symbolize status. Of the numerous tattoos permanently etched into his skin, the 'eggplant flowers' with a spiral center identify this Iban Dayak with headhunting exploits of the past. Stylized aso dragon motifs offer symbolic protection in this dangerous jungle environment enhanced with tribal superstitions. Birds are considered messengers whose flight and song contain omens for good or bad. Certainly the advent of a metal bird from a distant world--the four-prop airplane tattooed on his biceps--was a harbinger of the inconceivable changes in store for these tribal people.